This December something is happening that many people thought never would- we’re getting a new Star Wars film! Personally I am giddy over this, and in order to get ready for it I’ve been revisiting some of my favorite media in the Star Wars universe. 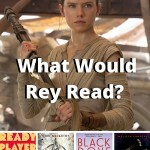 Games, TV shows and books all complement the movies, so there’s much to see and even DO in the Star Wars universe these days. Where does one begin? 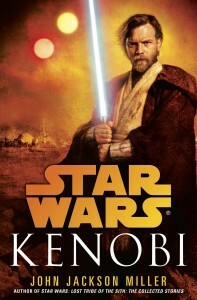 Kenobi by John Jackson Miller is an awesome book about how Obi-Wan Kenobi got himself settled on Tatooine after the events of Star Wars Episode III: Revenge of the Sith, and also how he got himself involved in a whole lotta drama he didn’t really want to get involved in. It’s hard to keep a low profile when there are Tusken Raider attacks happening all around you, teenagers sneaking to your hut to spy on you, and a mother who clearly wants more for her family than living in a general store in the middle of the dusty desert asking you for advice. If anyone can handle it, though, it’s Obi-Wan (sorry, he’s going by Ben now!) Kenobi. This is a particular favorite of mine because Obi-Wan is my favorite character in the Star Wars universe. 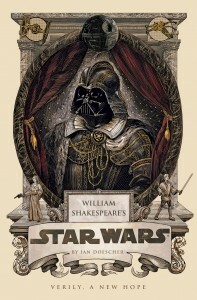 William Shakespeare’s Star Wars: Verily a New Hope by Ian Doescher is exactly what it sounds like- Star Wars written in the iambic pentameter made famous by the Bard. This is far from being dry and boring, though, because we’re already familiar with the plot and these versions add a whole new depth to the characters and story. 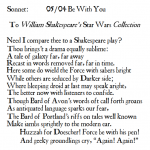 Deciphering Shakespearean dialogue such as “Alas, we two are made for suffering-/ I fear, R2, ‘tis but our lot in life./ More than six million forms of speech I know,/ Yet not a one shall help me now” has never been more fun! It’s older and definitely not canon, but it’s also one of the funniest things I’ve ever read and one of my all-time favorite graphic novels. In Kevin Rubio and Lucas Marangon’s Star Wars: Tag and Bink Were Here the Star Wars universe is turned on its ear. The comics tell the stories of the films from two unlikely perspectives: Officers Tag Greenley and Bink Otauna, two nobodies who happen to be in the right (or wrong) places at all the right (or wrong) times. 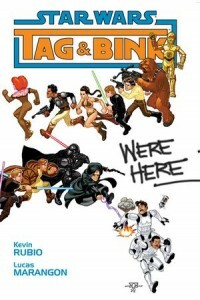 Tag and Bink Were Here is actually a collection of several Tag and Bink comics that span all of the years during the prequels and the original trilogy. Who knows? Maybe they’ll be back with the new movies! Here’s hoping! If you’re a big Star Wars fanatic like I am, actually being in the Star Wars universe is something that you’d love to do. The Massively Multiple Online Role Playing Game (MMORPG) Star Wars: The Old Republic takes place three thousand years before “Star Wars Episode I: The Phantom Menace” and is free to play. It’s rated T for Teens and gives you the opportunity to play a variety of different characters from Jedi Knights to Sith Lords and be the hero in your very own Star Wars tale. Every class of character has a different story line, and some of them intersect in interesting ways. There is the option to subscribe to the game, too, but it’s not necessary to pay to play. 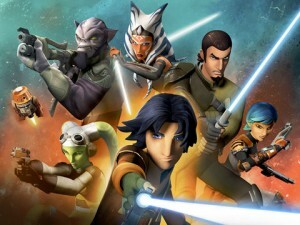 If gaming isn’t your thing, maybe you’d like the new Star Wars: Rebels series on Disney HD. I know, it’s a cartoon. And I know, it’s on a Disney channel. But this isn’t a cheesy kids show. 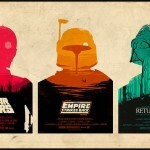 It takes place five years before “Star Wars Episode IV: A New Hope” and chronicles the beginning of the Rebel Alliance. The show is actually a very well written one that touches on some very deep issues, like freedom versus oppression and loyalty, just to name a couple. 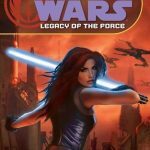 Characters don’t always survive episodes, the Empire gets the upper hand, and the Jedi are, as Obi-Wan Kenobi would say, all but extinct—with the exception of a few former Force users who are making life difficult for the Empire. There is a lot of action, a lot of character development, and some pretty wicked bad guys— including a very familiar one! Of course, there are always the novelizations of the movies, too. These are fun to read if you’re a fan because you can usually hear the characters very clearly saying the dialogue in your head. Or not. Sometimes the differences in dialogue can be glaring! But the excitement of the films is there, and often there is more depth on what a character is thinking that doesn’t always show on film. 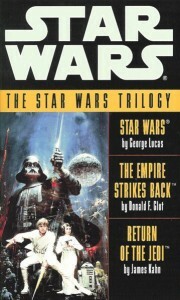 I actually read Return of the Jedi as a kid before I saw the movie, and it made me want to see the movie even more. There are many different covers for these, and I expect that as we get closer to the release of Star Wars Episode VII: The Force Awakens they may be released yet again. It’s hard to keep an old favorite down! Previous Post Graphic Novels: Not Just for Superheroes!